Someone just pointed out that "Thank You Note" is in the top 100 on Hype Machine. It's always nice to see music spreading to new listeners. You can download theWANDAS entire album New Wave Blues, featuring Thank You Note from smirp. Simply click here and set your price to download the entire album. If you don't have any dough, set the price to $0.00. If you haven't seen the video for Thank You Note, it was featured on FUSE TV on demand last month, you can view it below. It's been a quite a whirlwind for us over the past few months. We finished up a great tour, are back in Boston playing our usual circuit of MA, RI, & NYC shows. 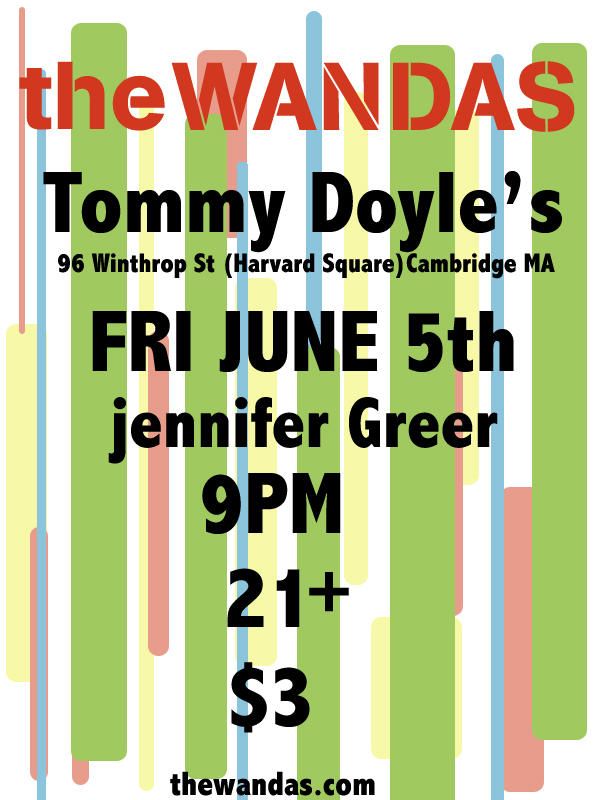 We have some good shows coming up; most notably our Gig this Friday at Tommy Doyle's in Harvard Square. For those of you who have seen us there in the past, you know it's always a fun time. Get there early as the show starts at 9pm and there is only one supporting act. Be sure to stay up to date in the Tour Section. We just got word that the Thank You Note video has been picked up by FUSE TV on Demand and will be featured for the month of July. That means you can pull it up whenever you want for the entire month. FUSE TV is free for most cable providers so if you have cable you probably have FUSE TV. We don't have cable so we'll be coming to your place to watch it. And for those of you in the video, there's nothing cooler than firing it up casually at a party and pretending you didn't know it was on. That's all for now. We've got some other tricks up our sleeve that we'll be unveiling in the coming months. This was our most interesting day of the tour so far. We added this show last minute because another show fell through. The name of the venue we were playing at was called Bank Shots. We pulled up to the venue and it had the vibe of the bar that the Blues Brothers play at in the movie. The bar was essentially on a concrete island in the middle of the highway. Locals call it the Fish Bowl because it's all glass. Although every single window in the place was broken, so the fish wouldn't have been too happy. We pulled up and no one seemed to know who we were or what we were doing there. After parking in their lot for about 30 minutes while everyone cycled into their bathroom, the owner finally came out drinking a fresh Budweiser can in the parking lot and informed us there were actually 4 Bank Shots in Delaware, all under different ownership; it's just a popular name. After breathing a sigh of relief because there was no PA at the Fish Bowl, we hurried up to the real Bank Shots with only 30 minutes to get their, get dressed, unload and setup our gear. We pulled up and were welcomed by the other band, Drunk Unkle, who was playing that night. They were a great bunch of guys. Extremely friendly and helpful. They let us use their entire setup so we only had to bring in our guitars which was a huge time saver. We were treated so well at the venue. The owner bought a bunch of our CDs, refused to let us pay for drinks and made us feel right at home. It was great playing with Drunk Unkle, they were an awesome cover band who really got the crowd going. They reminded the crowd time and time again to help us out and buy some of our merchandise; which they did in turn. It is safe to say we will be back in Delaware; hopefully at Bank Shots...in Newark, that is.. Right now we're spending Easter in a Walmart parking lot, but it's a super Walmart so it makes it special. Happy Easter! We pulled into Brooklyn around 5pm yesterday, hassle free. This gave us plenty of time to relax and walk around before the show. We always love playing in brooklyn. It's such a fun city and we have a lot of friends in the area. We went on at 11pm which was a perfect slot; just before local act Quiet Loudly. 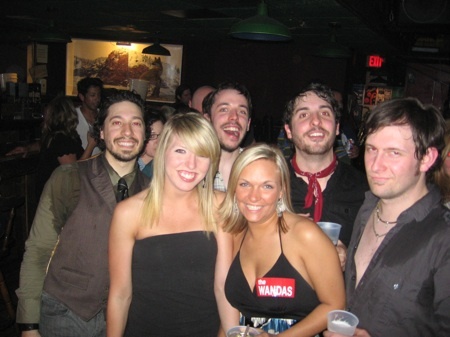 After we played, Ross, Keith, Will & Danielle went out on the town with some old friends. Brent stayed behind to rest up because he has been feeling a bit under the weather. It was a perfect night. Great music, good friends, beautiful weather and a lot of laughs. We didn't even get any parking tickets! The trip was capped off when we bumped into Nels Cline from Wilco this afternoon. Will chatted with him for a bit about is guitar playing and we were off. It's off to Danbury CT tonight! 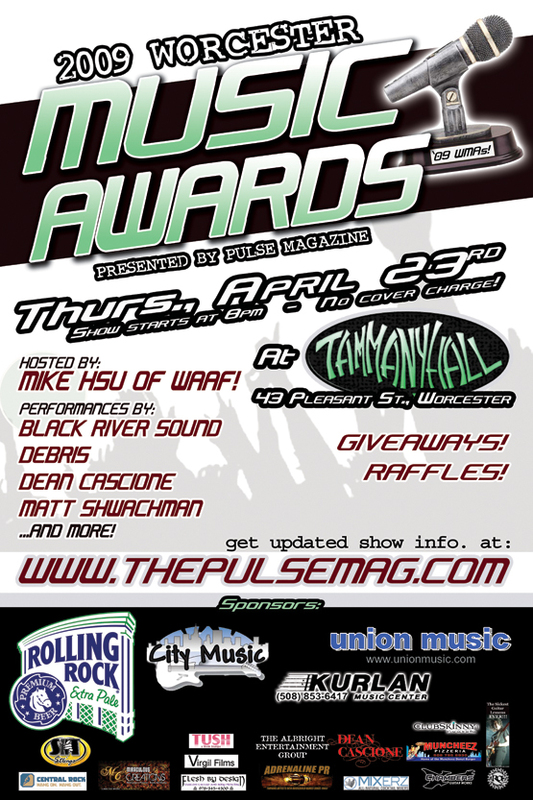 We're honored to be 1 of 4 bands nominated for Worcester's Best Pop Act in the Worcester Music Awards. 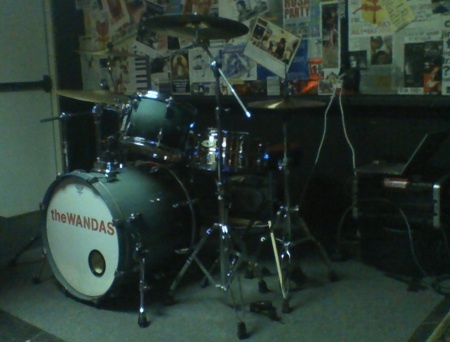 You can vote for theWANDAS and any of your other favorite acts by CLICKING HERE. Thanks for all of the support thus far. Until next time.. looks like it's a 1 in 4 chance. Here's a free add for Apple. Keith sings and plays John Lennon's "imagine" using the keyboard application on the iPhone. The four-piece group The Wandas separate themselves from the large pack of Boston pop bands with a tightly designed, smart sound. Besides the production from Patrick Krief (of The Dears) and the mastering of Ryan Morey (The Stills, Arcade Fire), the vocals from Keith McEachern and friends are a delight. It's always great to be recognized for your hard work and dedication. See you soon at one of our upcoming shows.